Week 17 PacHoops Pac-12 Power Rankings: The last one. We did it! Or rather they did, the twelve teams of the Pac, completed their regular season. And how about those seniors? Andrews for 47, a week earlier it was Scott as the P12 POW, and then Gabe York going full Steph Curry Bryn Forbes for us. Week 12 PacHoops Pac-12 Power Rankings: Halfway home. It took the ending of a 49-game home win streak to avoid having a 6-way tie for first place. It’s that kind of year in the Pac-12. Yet as far as I can tell, no one in Eugene cares. We’re halfway home and despite all the crazy talk this one feels pretty wrapped up. Maybe I’m crazy but Oregon seems the best, Utah seems the hottest, and WSU seems the worst. Maybe those are my mid-season superlatives with a hat-tip to Andrew Andrews. It’s my humble opinion that you’ll like it. Big thanks to Cody for joining us (give him a follow and check out his Pac-12 musings). You can also subscribe to our Podcast, here. 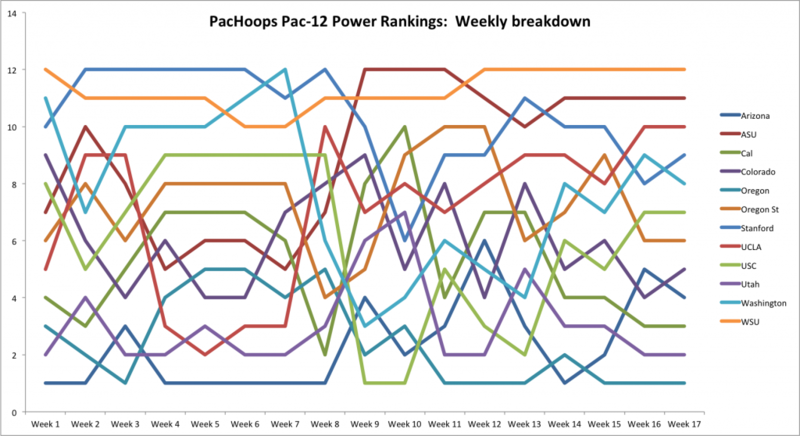 Week 8 PacHoops Pac-12 Power Rankings: Parity or parody? Without a doubt, this was the most difficult Power Rankings I’ve had to complete. Considered foregoing it. I dropped teams with noteworthy showings (Colorado, Stanford), while others made huge jumps because – yanno – last week’s second through fifth ranked teams went a combined 0-6. Standard stuff. Begging the question: Is the Pac-12 full of parity or parody? The former would suggest that good teams are losing on the road to equally challenging opponents. The latter, however, suggests we’re in for a season of laughable outcomes, an opportunity to perhaps enjoy our Western anonymity. But before you go diving onto the season’s panic button or attempt to rip your shirt off as you’re being escorted from the final minute of a rivalry game, remember that the Pac-12 is a historically difficult road game. Last season, home teams won 67% of the games – the third highest mark amongst conferences. This – my Utah and UCLA, friends – should have a calming affect. I think we can rest pretty well assured that this conference is full of champions! Parity. As you gander this week’s Power Rankings, I encourage you to take your criticisms directly to me. Comment on Facebook, Tweet at me, or email – let’s talk it out. 2016: the year of the discussion. Some of you might be thinking, “Isn’t it time we read about a new head coach at Washington?” And your feelings would be valid (they’re always valid here, guys). He’s coached four progressively worse teams, had character (Robert Upshaw) and transfer/departure issues (Nigel Williams-Goss, Jernard Jarreau), has seen a steady decline in attendance, and hasn’t recruited at nearly the level he once did (ya know, like NBA players). That opening question is valid. 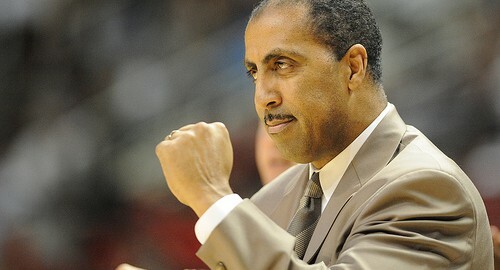 But Lorenzo Romar is still the head coach at Washington. And this season he’s bringing…optimism? We have to be future thinking but Romar has a Top-10 class on campus right now, and another lined up for next season. You can’t tell me that anyone other than Lorenzo Romar would have Markelle Fultz – a Top-10 recruit – committing to move to Washington from Maryland. He’s a summer commit to the class of 2016. That is rare. Arizona only just got their first 2016 commitment. And Romar swooped him from Kentucky, Arizona and Louisville. In a day and age when CBB rosters are fluid, when roster management is a year-in-year-out endeavor, Romar appears to have set himself up for some annualized success. Something he hasn’t had in nearly half a decade. We were a three pointer by a struggling if not disinterested first teamer from having the 10, 11, and 12 seeds advance. That’s contrary to the norm. The least tightly contested game featured the two most closely ranked teams. That’s contrary to the norm. Dan Kingma had nine points. That’s contrary to the norm. Of course we didn’t come to Vegas expecting chalk or things to go precisely according to plan (although I did remember to bring my ID to the airport for this trip. Big win.). So what was Day 1 like? Maybe we call it a practice run? The MGM Grand Arena wasn’t quite bubbling to the top but – and this needs to be said – the PA guy called 4 games with unwavering enthusiasm. And he’ll be back at it again for Day 2. As for the basketball? Oregon perhaps took a little wind out of Utah’s sail and Larry K said that now is the time for less talk and more action. So Spencer and I talk about all of the Pac-12’s forthcoming action including Arizona’s trip to what should be a raucous Muss (but hopefully not inappropriately so). Perhaps it goes without saying that – one week from March – we delve into Bubble Watch and all of the OPPORTUNITY! for the Pac’s bubble squad of UCLA, Oregon, and Stanford. They’ve won fewer games than the year prior for three consecutive years. The recruiting has gone stagnant; they literally had no 2012 class. Last season was the worst defense (104.5 Drtg) that LoRo has ever put on a court. The program’s struggles are quantifiable if not palpable. Average attendance at Hec Ed since 2011 has grossly declined: 9650, 8785, 7937, 6582. It’s fair to say the seat is warming. But I see a light from within this tunnel. Look at this year’s roster. It’s not soon to wow you but it’s balanced and youthful and projects. And then you note that Washington already has commitments from four 4-star recruits in 2015 and one 5-star in 2016. Encouragingly, two of those ‘I-do’s’ have come from local kids. I see a light. But for this season, I think we’re still in the tunnel.